Hot dog, hot dog, hot diggety dog! If you've ever had a hot dog, you probably also have a place and particular memory about it, too. A lot of times these simple little "hand meals" include stories of where we were and why we were there. Me - "What does a Chicago Hot Dog have on it?" Him - "Just regular stuff." Me - "What's the regular stuff?" Him - "Hot dog stuff, that's it." Me - "But, what makes it different?" Him - "It's not different, it's just a hot dog." Me - "But it's a Chicago Hot Dog, so what makes it a Chicago Hot Dog?" Him (laughing just a little too hard in my opinion ) "There's no such thing"
Him - (interrupting me) "That's crazy, we just have real hot dogs"
You can imagine how that went over with me, right? After 17 years, we still laugh at our "hot dog argument". Now, even he agrees that hot dogs are very region specific and he takes great pride in his Chicago Vienna on a poppy seed bun with a tomato, pickle and pepper stacked on top. Of course, living in a city as culturally mixed as Los Angeles, there are a number of famous and infamous hot dog stands that try to cover all the variances: Pinks being one of the best known. However, if you want to really feed your hot dog hunger and include some of the best sweet potato fries along with it, I'd try The Slaw Dogs in Pasadena. When I was there recently I overheard a mom talking to her two pre-teens about food choices and being open to new tastes. Shockingly, they were listening, too. On the table were hot dogs that included vegetables and when we spoke she told me this was their second time at The Slaw Dogs within it's first weeks of opening. At this window front cafe you could get hypnotized by the choices on their menu board: Vienna All Beefs, Veggie, Sausages, Thai inspired, BBQ Picnic inspired, Classic with cheese, and a long list of customized toppings. You wouldn't think so many ingredients could be piled on a bun and balanced on top of a wiener, but it works. And the fresh, sometimes toasty bread holds up fairly well as long as you don't wait too long to eat it, which wasn't a problem with me or my husband. The owner, and happily busy cook behind the kitchen window is Ray Byrne. You can tell this is his baby and he's loving it. The Slaw Dogs is the kind of casual, neighborly place that on your first visit feels like you've been hanging out there already. Expanding even further into the hot dog world of sausages, you can't do better than Wurstkuche in downtown Los Angeles. You can chase it all down with one of their "list as long as my arm" beers and ales. The wall is lined with draft spouts and the counter lined with non-alcoholic drinks in every flavor combo ever bottled. Once you have your order placed and your number in hand, just walk back to a vast roofed Bavarian garden with community tables and a bar. While eating with my daughter's German-born fiance, I was assured that this place does a fine job of representing the flavors of his home town of Munich. Then there's the good ol' hot dog you make at home - grilled, boiled, broiled or sauteed. I introduced my kids and hubby and his Chicago family to the hot dog of my youth in North Carolina; the mustard, chili, coleslaw goodness I spoke of in my argument. Sometimes we have themed nights of "NC Hot Dogs", especially when we want to keep it fast, but delicious or want an easy "pick it up and take it outside" kinda meal. Our Hot Dog Nights became tradition on Halloween because it gave us something easy to fix before taking the kids out trick-or-treating and some of the neighbors would stop by for one before we all went out together. The chili recipe is one that my Grandfather used to make for family nights at the YMCA. The coleslaw recipe is like the ones made by Mom, aunts, Grandma and church folks. It always varied a little based on how much time they wanted to spend on chopping the cabbage. Sometimes it was chunky, sometimes very fine. At the house with my mom, or in Los Angeles with our family - we've tweaked the product to include organic, no-sulfite wieners, turkey dogs, sausages from our local butcher, lean ground sirloin for the chili and Farmer's Market cabbage and carrots for the slaw. I make the rolls with whole wheat flour dough prepped in the bread machine. A healthier version without sacrificing the "style", oh yeah. *In a large skillet, caramelize the onions in the olive oil on low/med heat for about 10 minutes. Stir often. * When there is no more pink to the meat, add the Chili Powder, Paprika, salt and pepper to taste. * When all mixed in, add the Tomato Paste and stir to combine. Cook this down for about 5 minutes to create a deep dark and flavorful base. * Add the ketchup and just a bit of water, stir and cover with a lid. * Reduce heat to low and keep to a bare simmer for about 30 minutes to 1 hour. Add water as needed to keep it from burning or getting too dry. Stir once in a while. * Serve warm for hot dogs or it's also good with eggs. * Mix all ingredients in a bowl, cover and let marinate in refrigerator for at least 2 hours. 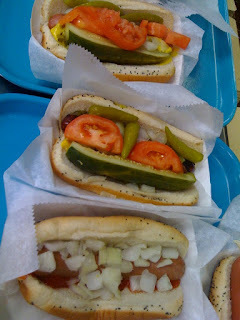 Hot Dogs can evoke so many reactions, from the Shake Shack in NYC to Dodger Dogs in L.A., to the Red Hots in Chi-town. Where is your favorite hot dog, and what makes it yours (and don't say it's just a regular hot dog) ? great post, I will have to try to recipe one day. I felt for you in that argument. I was like "Let her talk!" and i want to try Slaw Dogs REAL soon. You got me hungry again. I only had my dinner 2 hours ago. Great post! That was great and yummy! I just tried Slaw Dogs last weekend cause f your post. It is just around the corner from me and I had no idea. Yummy! I love Wurstkuche too. I have never made chili but yours sounds and looks so good I think I will try. Country Ham, Grits and Red Eye Gravy - Oh My!